My great-great-grandmother was Wilhelmina Schmeling of Prussia. I have to say, conducting research about a country which no longer exists is quite the challenge! 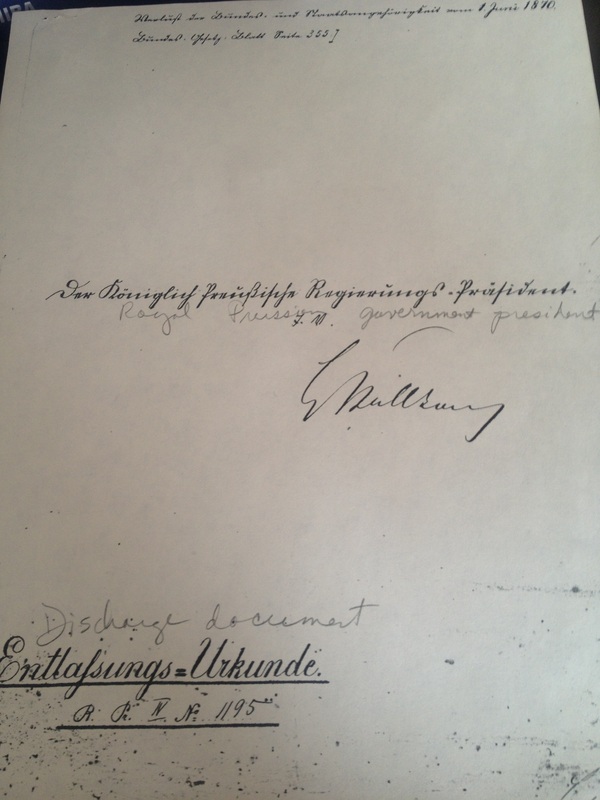 When my grandmother was ill with lung cancer at the end of her life, she sought out someone to translate some old documents from her grandparents who came from Prussia. The German teacher at my high school graciously offered to help. The documents in this post were partially translated by her, but some was written in the (largely) extinct Prussian language. 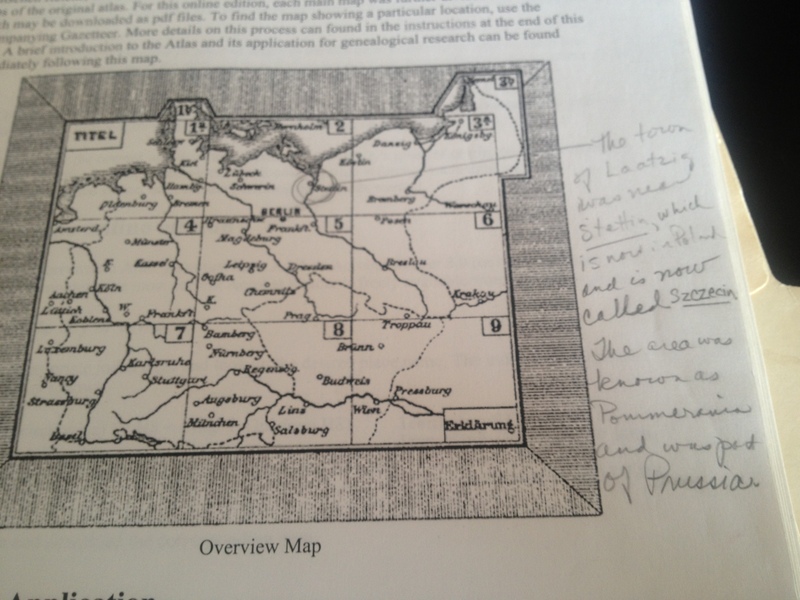 The text points out that the Schmelings were from a town called Laatzig, near Stettin, which is now called Szczecin and is part of Poland. The area was known as Pommerania and was part of Prussia. The parts that were translatable on the application to emigrate basically state: they asked permission to emigrate to the USA in 1884. Franz Friedrich is 28 years and 7 months old and from Laatzig, Pommerania. His wife, Wilhelmina is 26 years and 9 monhts old. They have 2 children, Maria Magdalena, 7 years 2 months old, and Wilhelmina Albertine Augusta, 8 months old. The small print at the bottom is in Prussian and the teacher could not translate it. 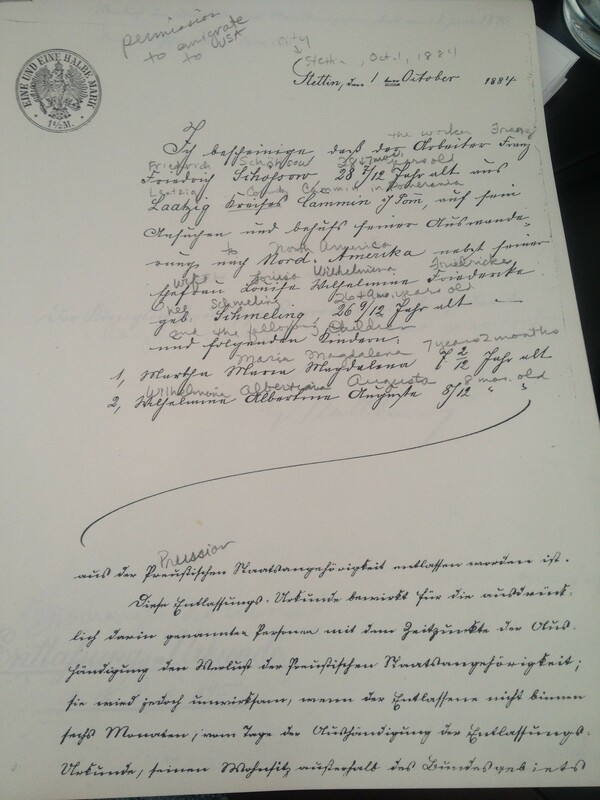 The second page is signed by the “Royal Prussian government President”-though I can’t read his name. The caption at the bottom says “Discharge Document,” so their application was approved. I think it is significant that 1. they had to apply to emigrate, 2. it was approved, and 3. they went about this in the legal manner, instead of just “fleeing” to the United States. I can’t make any solid conclusions, other than to say I think that’s significant in some way. “Wisconsin, Births and Christenings, 1826-1926,” index, FamilySearch (https://familysearch.org/pal:/MM9.1.1/XRNF-GV6 : accessed 01 Mar 2014), Frank Schessow in entry for Emma Ida Louisa Schessow, 10 Apr 1887. I know a fair amount about the Schessows, but not the Schmelings. I don’t know if Wilhelmina (Minnie) had siblings that also emigrated to the USA, or if everyone stayed in Prussia. The Schmeling surname is one of my brick walls! Especially frustrating is the fact that I have other documents that might be able to help me, but I can’t translate them. I found this Youtube video of a person purporting to speak the old Prussian language. Obviously, I can’t understand him so I have no idea what he is saying and can’t vouch for its accuracy. It’s interesting nonetheless. Do you have Prussian ancestors? I’d love to hear about how you approach this in your research. This entry was posted in Surname Saturday, Uncategorized and tagged Prussia. Bookmark the permalink. ← How Far Back: Charlemagne? Genghis Khan? Adam and Eve? Fantastic idea! I will definitely check that out. Thank you so much! Good luck! Let me know if you get an answer!